So you've decided to jailbreak your device, downloaded a proper utility from the website pangu or taig, connected your smartphone to your computer, and launched the application. After several reboots, a message was displayed on the screen confirming the jailbreak's success and the Cydia application was installed on the device. It seems that everything worked fine, but what's next? If you've ever asked yourself this question, this article is for you. One of jailbreaking's most beneficial advantages is the ability to fine-tune the device, improve its interface, and expand its functionality. Users get all these advantages only after the installation of special software also known as "tweaks." Nobody can say exactly how many tweaks exist out there today, but it's obvious that there are a lot more of them than a typical user needs. So we will use this article to have a crack at describing the most useful tweaks that can help turn your iPhone into what might be called an "ideal smartphone." Most reviewed tweaks require Respring, or the rebooting of the device's Springboard (lasting 10-15 seconds) in order to introduce changes into the system. When you install the tweaks described in this article, don't forget to remove old ones that perform similar functions, otherwise the device may switch into Safe Mode. cydia.vn – a repository with a large number of paid tweaks from other resources that can be downloaded here for free. However, the download speed is rather low. apt.modmyi.com – one of the most popular repositories. There is a huge number of the most varied tweaks, but many of them are not free of charge. repo.insanelyi.com – lots of cracked tweaks, quick upload of updates and new packets. cydia.zodttd.com/repo/cydia – another popular and stable repository. There's no need to sweat using the BigBoss repository. It's one of the few sources where finding unstable or unsafe tweaks is nearly impossible. Some tweaks should be installed right after jailbreaking the device because without them further customization of the device might prove impossible. Usually these types of tweaks are available in the BigBoss standard repository. First of all, take a look at the WhiteTerminal application. This utility allows users to work with the device in the command line mode and makes it possible to launch many other utilities that lack a graphic interface. This tweak is very simple and imitates the Terminal application on OS X. If you plan to install cracked applications on the device (which is one of the main reasons to jailbreak in the first place), download AppSync. The tweak available in the https://cydia.appaddict.org/ repository lets users download detached software from computers using solutions like iFunBox or iTools. If you intend to work with the device's file system from your computer, you will need afc2add or Apple File Conduit "2". Neither of these utilities have any interface, and they both have just one purpose: to open up access to the root of the device's FS when connected to a desktop. WinterBoard tweak is used for global changes of the Springboard (desktop); a huge number of different themes and add-ons have been created for it. It can change the look of the dock and icons, let users add widgets to the desktop, and much more. 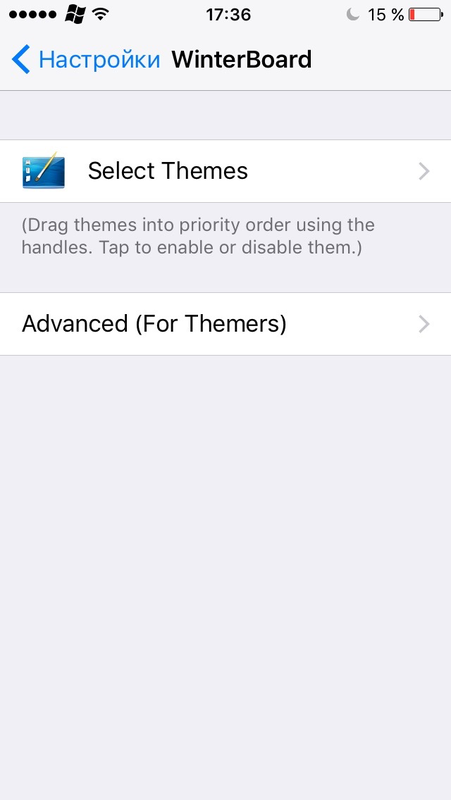 All WinterBoard themes are stored in the /Library/Themes/ folder, where they can be extracted and modified. There is also a huge number of high-quality and elaborate themes that not only change the view of the desktop, but also some menus as well (while remaining highly customizable). Despite the fact that iPhones have more standard settings than many firmware versions of Android, some options are still missing. This issue mostly concerns the fine-tuning of the interface and can be solved using Springtomize, which is already available for iOS 9. The utility's settings are divided into option sections for specific interface elements. 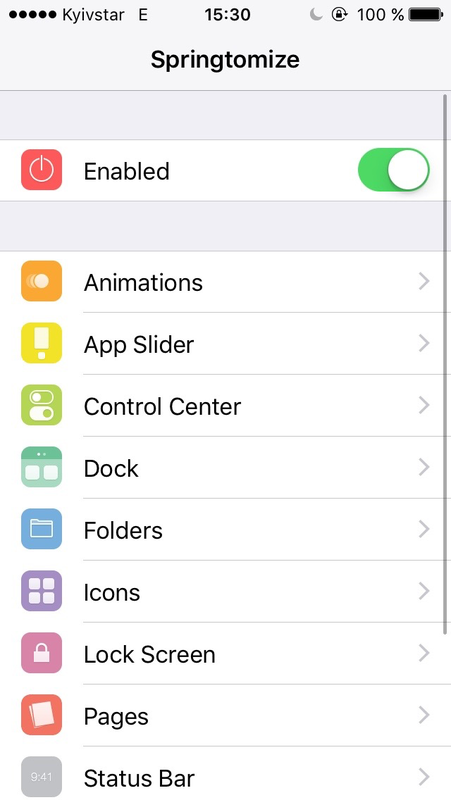 You can slow down the speed of animation, configure the creation of multi-level folders, remove the slider from the lock screen or conceal dividers in the Control Center, enter in the operator's own name, and make many other improvements to the interface. Android users often claim that Apple's OS lacks desktop widgets. The iWidgets tweak adds this functionality. 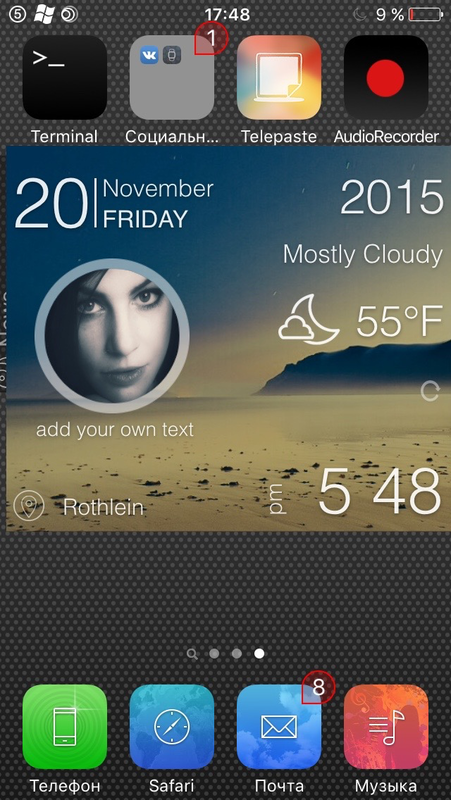 Initially only two widgets are available (analog clock and calendar), however, it is possible to acquire more: WinterBoard themes and Cydia both offer widgets that work using this application. Simply tap an empty spot on the home screen and you will see a menu of widgets available for installation. All widgets are stored in the /User/Library/iWidgets/ folder that users can fill up on their own.